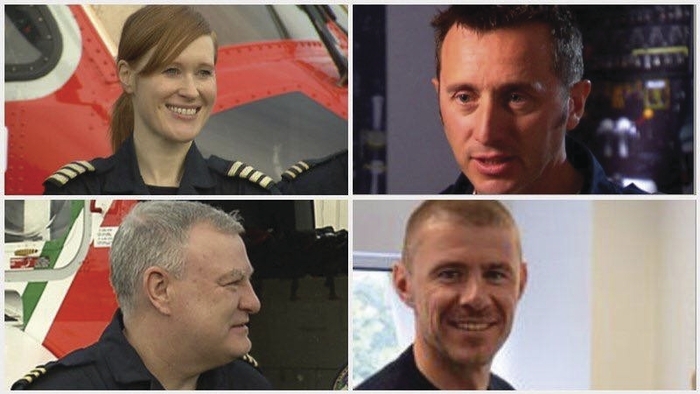 The late Captain Dara Fitzpatrick, Mark Duffy, Paul Ormsby, and Ciaran Smith, the crew of Rescue 116 which crashed off Blacksod in the early hours of Tuesday morning. Photo: Irish Coast Guard. An operation to recover the three missing crew members of the Rescue 116 helicopter, which crashed into the sea off Blacksod in the early hours of Tuesday morning, was continuing yesterday afternoon, as this paper went to print. Captain Dara Fitzpatrick (45 ), who was recovered in a critical condition on Tuesday morning after the crash, passed away in hospital later on Tuesday. Ms Fitzpatrick, a mother of a three-year-old son, was spotted in the sea by the Shannon-based Coast Guard helicopter at daybreak on Tuesday and was picked up by the Achill based lifeboat and brought ashore. The other three crew members are Ciaran Smith, Mark Duffy, and Paul Ormbsy. An ongoing search operation has been under way since the helicopter lost contact with its base before 1am on Tuesday morning involving Coast Guard helicopters, RNLI lifeboats, the Air Corps, Irish Naval Service, a marine research ship which is equipped with multibeam sonar that can scan the sea bed, and local fishing boats. The Dublin based Rescue 116, a Sikorsky S92 helicopter, had been providing assistance to another Coast Guard helicopter, Rescue 118, which was undertaking an evacuation from a ship off the coast of Mayo and was returning to Blacksod to refuel, before it crashed.Throughout Tuesday a large amount of debris from the downed helicopter was brought ashore as the search for the three missing crew members continued throughout the day and night. Naval Service and Garda divers arrived in Blacksod to assist with the search in the waters which have a depth of between 30m and 50m in the search area, which extends out as far as Blackrock Lighthouse 13km west of Blacksod. President Michael D Higgins on Tuesday said: "Today marks a dark day in the history of the Coast Guard/Garda Cósta na hÉireann, with a member of this important service losing her life while providing assistance to others. On behalf of the people of Ireland, may I pay tribute to Captain Dara Fitzpatrick who died today. We are all grateful for the courage, resolution, and exemplary commitment to the aims of the Coast Guard that Captain Fitzpatrick and her colleagues have consistently displayed. My thoughts are with her family at this difficult moment and also with the families of the missing crew. "It is appropriate that we acknowledge and pay tribute to the efforts of her colleagues at the Coast Guard who have been working at a time, which must be for them, a time of great grief and uncertainty. May I also commend the other emergency services, as well as those from local communities in Mayo, who responded so valiantly, and in great solidarity, at this time of tragedy." Mayo based Senator Rose Conway-Walsh said: "It was with deep sadness that I learned of the passing of Captain Dara Fitzpatrick, a veteran of the Irish Coast Guard, and I extend my condolences to her family, comrades, and friends. I, like many others living on the Mayo coast, know of the dedication and professionalism of the Irish Coast Guard who have provided assistance on many occasions to fishermen, seafarers, and many others who have gotten into difficulty over the years. I want to pay tribute to the efforts of the Achill and Ballyglass Lifeboat Service and all other emergency services who are currently involved in the search. We can only imagine how difficult it must be to be involved in such a search, especially when it involves colleagues of this vital service.